What are Table Talk Cards? 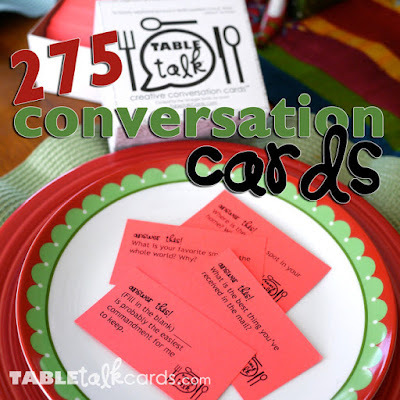 Table Talk Cards created by our family for yours and are a Box of 275 Creative Conversation Cards which will add flare & depth to your everyday conversations or gatherings with the people you love most. No rules, just grab a card and ask away to unlock those unique conversations and reminiscing moments. For 2 or more players, great for all ages, basically anyone who can read and communicate and you'll enjoy the faith based questions ones as well. Follow our TableTalkCards.com Instagram account @TableTalkCards for sampling of our questions. Buy our box of TableTalkCards here!